TripAdvisor. Chances are you’ve not only heard of it but have used it. TripAdvisor is the world’s largest travel site, covering the biggest selection of travel listings worldwide. The review site, headquartered in Needham, MA, empowers people to discover information and opinions on destinations to visit, restaurants to dine at, and activities to book, from real people giving real reviews. When their CEO, Stephen Kaufer, founded TripAdvisor in 2000, his mission was to help travelers around the world plan and book the perfect trip. Today, TripAdvisor powers over 630M reviews and opinions and has an average of 455M monthly visitors. At SinglePlatform, we’re a proud partner of the TripAdvisor brand. Millions of people turn to TripAdvisor to read reviews and see pictures of places they’re considering visiting. With 84% of people trusting online reviews as much as a personal recommendation, TripAdvisor has seen immense success in the travel and hospitality world. But, TripAdvisor doesn’t only benefit the reviewer or the reader, it benefits you, the business that’s being featured as well. 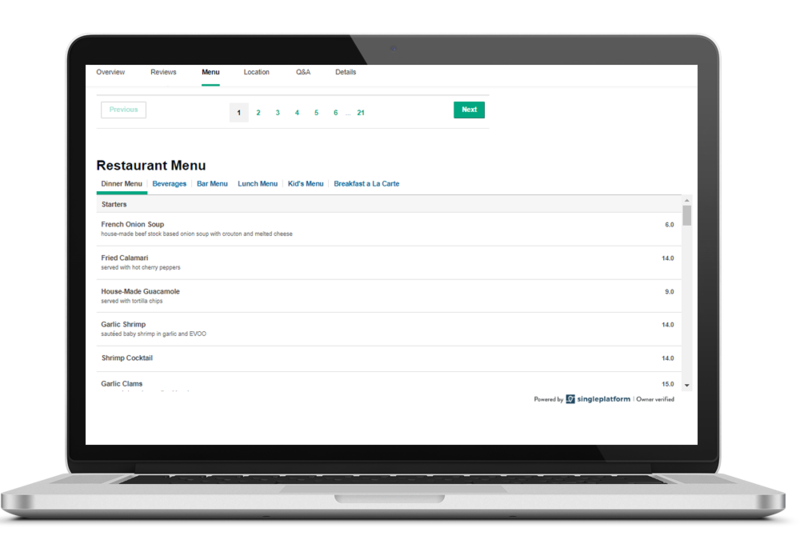 The popular forum is a great way to gain exposure for your restaurant online by getting in front of millions of people who are using the website or app every day. Plus, claiming your listing on TripAdvisor is free for your restaurant, so it’s basically a no-brainer. So, just how influential is TripAdvisor when it comes to choosing a restaurant? The company performed research to find out how many people actually use the tool for dining decisions. The response was overwhelming. 96% of people noted they use TripAdvisor when looking for restaurants while traveling. When researchers are at home, TripAdvisor influences 78% of dining decisions. People trust TripAdvisor when it comes to the trustworthiness and accuracy of online reviews. They also find that TripAdvisor has the most helpful restaurant reviews and photos. When it comes to new restaurants, 90% of people in the US note that they’ve discovered new restaurants to dine at by using TripAdvisor. Clearly, TripAdvisor has a huge impact on where people choose to eat. Want more facts and stats? Check them out here. What Can You Do on TripAdvisor? Creating a TripAdvisor account is free! With a free TripAdvisor account, you can edit your business details to ensure information accuracy, add photos, and respond to reviews (this is important!) It’s essential to take control of your restaurant’s online presence, so we encourage you to claim your TripAdvisor listing to ensure you’re being represented truthfully online, and so that you can interact with users. Upon entering the TripAdvisor website, users are prompted to search for a destination or hotel, so they can start a search as vague or specific as they’d like. But, they don’t just stop at hotels. TripAdvisor also covers the restaurant industry. They have a separate tab specifically dedicated to restaurants, which can be accessed through the homepage. TripAdvisor currently features over 4 million restaurants worldwide and gives the user the option to search by location, cuisine type, or restaurant name. Plus, searchers can even make online reservations through TripAdvisor if they find a restaurant they decide is a must-visit. You can easily see the overall bubble rating, the contact information for the business, photos, and even the menu (that’s where we come in). If a user likes what they see but wants to do more research, they can easily navigate to the restaurant’s own website from TripAdvisor or make a reservation directly from the TripAdvisor listing. Once you’ve claimed your TripAdvisor listing, it’s easy to customize your page with your business information, menu, and photos. If you’re already using SinglePlatform, some of the work will be done for you. As mentioned, SinglePlatform powers menus on TripAdvisor and has been doing so for years. As a menu management company, we push our customers’ menus from our portal to all of the websites that matter, including TripAdvisor. This ensures that a restaurant’s online menu is distributed with consistency across channels and accurately as owner-verified information. An accurate menu and restaurant profile mixed with online reviews is a recipe for a restaurant’s success. TripAdvisor didn’t just stop there. They’ve expanded their offering by introducing TripAdvisor Advertising, which allows restaurants and other businesses to drive traffic to their listings through sponsored placements. These ads are shown on desktop and mobile and are pushed out to a highly targeted audience who are looking for places to dine in your area. The purpose? To give restaurants the option to gain even more visibility on TripAdvisor. TripAdvisor also offers a Premium product for Restaurants, which gives you additional tools like Storyboard, Top 3 Reasons to Eat Here, Favorite Reviews, and exclusive data & insights. To explore Premium, learn more here. TripAdvisor & SinglePlatform stress the importance of a solid online presence and encourage you, as a restaurant owner, to take advantage of the tools available to you. In a world where word of mouth spreads online, it’s essential to be part of the conversation. TripAdvisor can help you do just that. We look forward to working together to provide our customers with the online exposure you deserve.